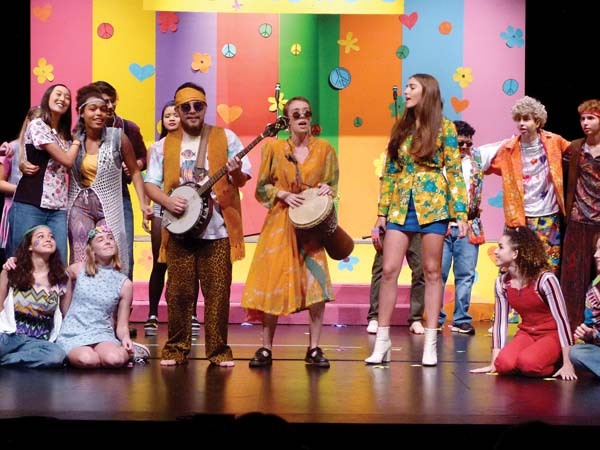 Set in 1969, college students Travis (Henry Woodward), Muriel (Electra Richards) and Alice (Keilana Calder) decide to throw a free “Music, Beads and Flowers” concert celebration. Pop-rock band the Lemon Bugs (Isa Pandolfi, Eva Richards and William Shaver) get wind of the festival, love the free concert concept and decide to donate their musical talents as the headliners of the now blossoming youth celebration. Word spreads quickly and soon a bevy of young people begin to descend upon the festival site, Crumb’s Apple Farm, in colorfully painted school buses. The parade of peaceniks run the gamut of 1960’s cliques from California Cowabunga (Madelyn LaCount) and California Ivy (Michael Enovijas) who surf on dry land, to a traveling bead giver (William Yudis), London fashion designer Mary Quaint (Lilah Li) who plans to release a line of Flower Power clothing, to Hippie Girl With A Flute (Pua Kepler). Kepler takes the lead on one of “Groovy’s!” musical highlights, “The Pied Piper of Rock and Roll,” with the entire cast. Everything is “groovy” until crabapple Mrs. Porter (Juliet Moniz), who loathes “The Love Generation,” demands that the local Sheriff (Sampson Campbell) shutdown the concert Be-In. 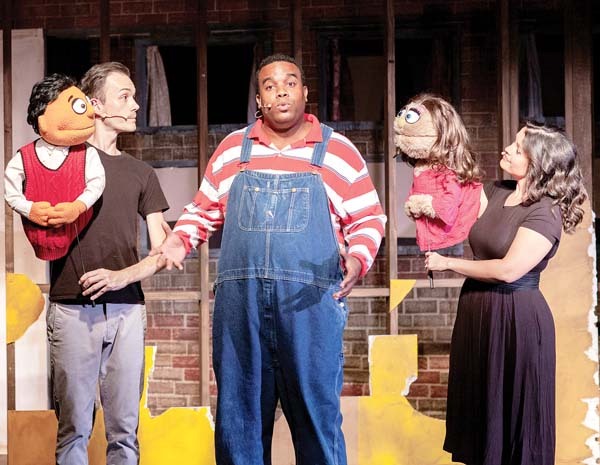 Congratulations to the Maui Fringe Theater Festival 2019 Award winners. “Seeger,” written and performed by Randy Noojin, captured both Best in Festival and the Hoku Award for best performance. 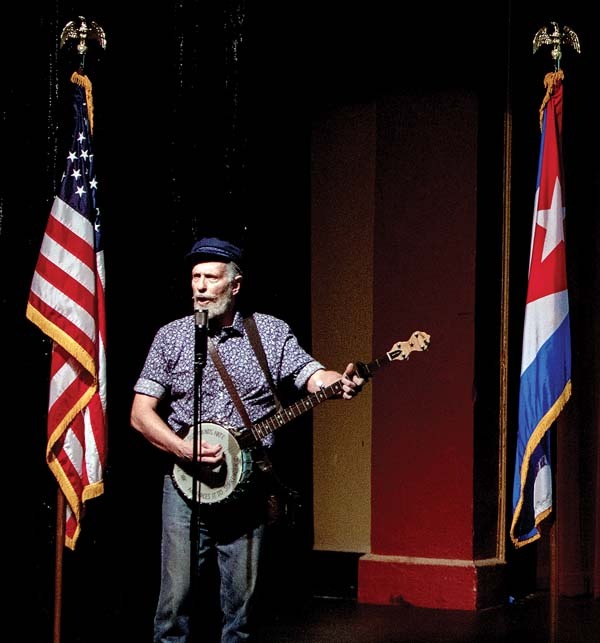 The uplifting, and at times tear-jerking, journey through 40-years of legendary folk singer Pete Seeger’s life, had audiences singing along throughout the show to tunes like, “If I Had A Hammer,” “Turn, Turn, Turn,” Where Have All The Flowers Gone” and “We Shall Overcome,” and on their feet in standing ovation at show’s end all weekend long. Kate Robards placed second with her true-life, one-woman show “PolySHAMory,” an exploration of her doomed polyamorous marriage. Robards embraced the old adage of “tragedy plus time equals comedy” in this affecting and amusing serio-comedy that ranged from tearful scenes with her battered and abused best friend in an emergency, to hilarious one-liners like “fruit punch” being her sexual safe word. Wayne Moniz’s powerful and true tragic drama, “Cane Fire: The Hanapepe Massacre,” finished in third place, lead by an exceptional performance by Wayne Shakey Boteilho as 1920s Hawaiian labor organizer, Pablo Manlapit. Maui Fringe audiences chose OnStage Dance Company for the Audience Choice Award. This debut of Maui’s newest dance company thrilled its large and supportive crowd with 14 original pieces choreographed by Felicia Chernicki-Wulf, Erin Kowalick, Sarah Loney Mark, Dejah Padon, Camille Romero and Kalani Whitford. The dances showcased the talents of local dancers Julia Wagner, Nancy Ichikawa, Megan McNicholas, Nadine Frommer, Rachel Lockhart, Brittany Smith, Kelley McCarthy Cerny, Jamie Wilcox, Jessica Nelson, Lia De Souza, Nicole Heinlein, Tanya Unemori, Marnie Meuser, Margi Calder, Emily Engh, Laura Cole, David Johnston, Suzannah Lane, Jessica Dungans, Denise Green, Sheri Brinks, Hana Valle, Marsi Smith and Ellen Peterson. 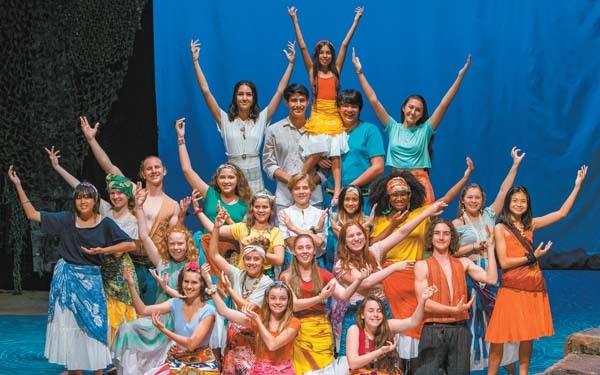 The 10th Maui Fringe Theater Festival 2020 will take place Jan. 24 through 26 at the Historic Iao Theater in Wailuku. Original one-act plays may be submitted in September. For more information, visit www.mauionstage.com. 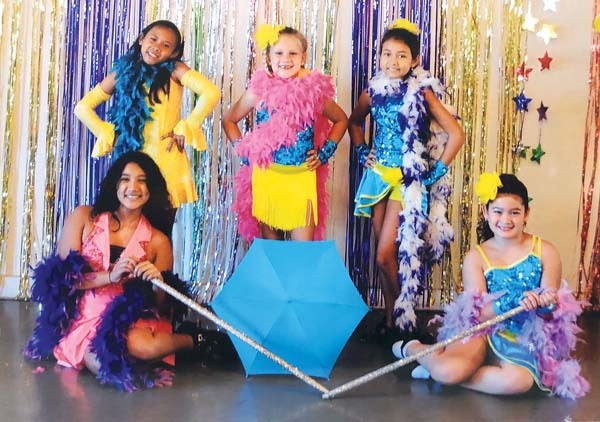 Join Judy Ridolfino and her students on Saturday for “Judy’s Gang: Shmoovies!,” the annual dance showcase featuring tap and jazz dancers from ages 3 to infinity as they present a combination of choreography from shows and movies. 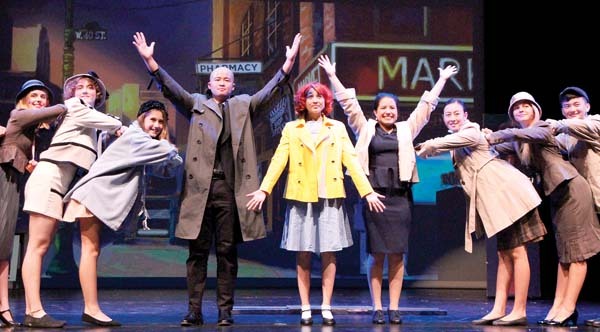 “Shmoovies!” takes audiences on a musical dance journey from “Hairspray” and “Rio” to “Grease,” “Burlesque,” “Coco” and more. Also performing are singers Tia Cabrear and Lovely Lei. • Performance is at 5 p.m. Saturday in Castle Theater at the Maui Arts & Cultural Center in Kahului. Tickets are $13 (includes all applicable fees), with children 4 and younger admitted free. For more information or to purchase tickets, visit the box office, call 242-7469 or go online to www .mauiarts.org. ProArts concludes “It’s Only A Play” by Terrence McNally, directed by Francis Taua. Julia Budder (Sharleen Lagattuta) is a first-time Broadway producer of “The Golden Egg,” a play by Peter Austin (John Galvan), its panicky playwright. Budder hosts an opening night party at her posh Manhattan apartment where all await the reviews to come in. 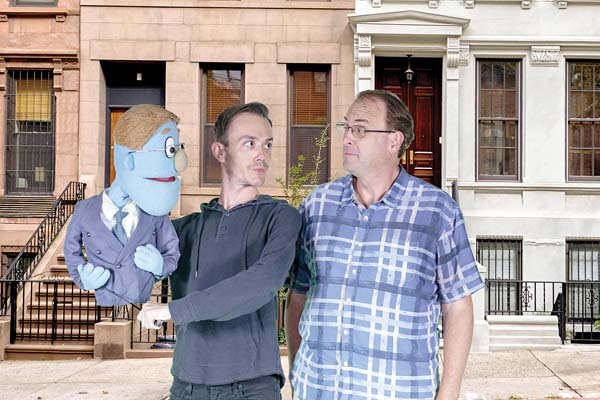 Her guests include Peter’s best friend James Wicker (David Belew), a big-headed television actor and Pilates classmate of Ryan Seacrest; Virginia Noyes (Kathy Collins), the self-indulgent, aging star of the play who is required to wear an ankle monitor; Frank Finger (Logan Heller), the wunderkind British director of the show; Ira Drew (Vinnie Linares), a timid theater critic who secretly yearns to be a playwright; and Gus (Elisha Cullins), an “actor-slash-singer-slash-dancer-slash-comedian-slash-performance artist-slash-mime,” who is temporarily checking coats at the party. The eagerly anticipated New York Times review finally arrives via smart phone in the second act. A scathing and lengthy review more than poaches “Egg,” which only amplifies the chaos of this angst-filled, wild farce. 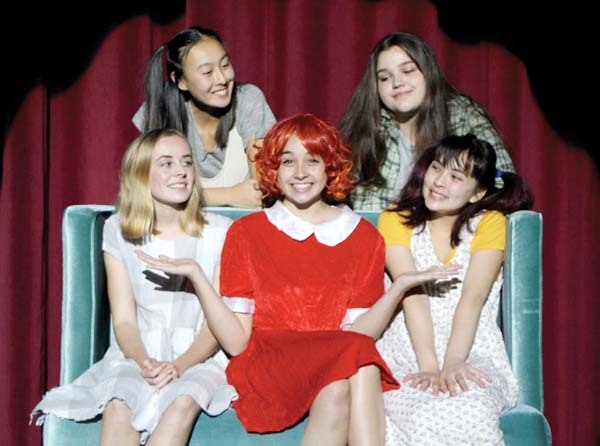 • Performances are at 7:30 p.m. Thursday through Saturday and 3 p.m. Sunday at the ProArts Playhouse at Azeka Place Makai in Kihei. Tickets are $26. For more information or to purchase tickets for any ProArts event, call 463-6550 or visit www.proartsmaui.com. The MACC presents Tomas Kubinek in performance. Born in Prague, Kubinek became passionately interested in clowns, circus, theater and magic at an early age. When he made his circus debut with a Brazilian clown duo as the rear half of a two-person horse, there was no turning back. Kubinek has studied with some of the world’s greatest teachers of theater and, combined with his own tireless experiments in the art of live performance, created award-winning solo stage shows performed throughout the world. Called “equal parts old-time clowning and Monty Python-esque silliness” by the Seattle Times, this collision of theater and music-hall is equal parts comedy, vaudeville and stage charm. 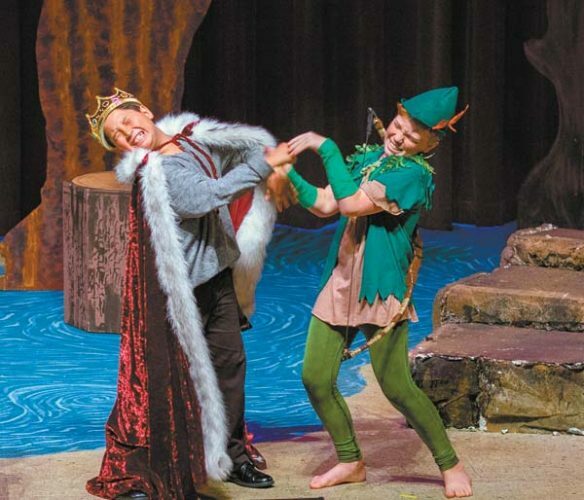 • Performance is at 7:30 p.m. Friday, Feb. 8 in Castle Theater at the MACC. Tickets range from $30 to $40 (plus applicable fees), with half-priced tickets for children 12 and younger. To purchase tickets, visit the box office, call 242-7469 or order online at www.mauiarts.org.